All British hopes are focused on Andy Murray, who reportedly had health problems in the past few weeks. As a list-maker myself, I am fascinated with other people’s “to-do” lists. My lists, however, always get mixed up with household tasks as well as work, so you might find a very important meeting listed next to a list of groceries! It will certainly appear cryptic to someone reading it 30 years later. But as a 22-year-old, Richard Branson, the owner of Virgin Airlines (possibly one of the best airlines in the world), showed a very focused mind as he listed his priorities, which were about improving himself, his need to interact with others and to get his business going by opening more Virgin Record stores and buying material for his record studio — the Manor. He has a self-confessed love for lists, but it works for him as he achieved many of the ambitions found in this list made decades ago. There might be some wish-fulfilment hidden in list-making. Just look up “to do” lists you made as a teenager or later, and you will be surprised to find how many you have achieved. I found my diary, which I had written when I was a 10-year-old, where I had written down my ambition to be an author, and 40 years later I have achieved my childhood dream. Hopefully, you will have achieved your dreams faster! Wimbledon is here and so are strawberries! But July is turning into a real scorcher as parks turn into beaches with people stripping down to the bare minimum — there are more bare bodies on the grass than flowers. Some “beaches” with real sand have been created as well: one on South Bank which is immensely popular with children — imaginatively placed next to the river Thames, just in case you can’t afford to travel. 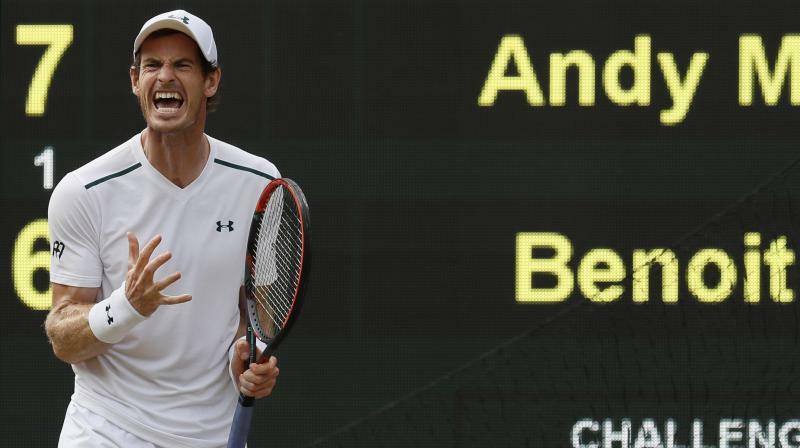 All British hopes are focused on Andy Murray, who reportedly had health problems in the past few weeks. At one stage, there were four British players beyond the first and even the second round. But two have fallen by the way. We still have the gorgeous Jo Konta, who is advancing in the women’s section and, of course, our Andy. Meanwhile the UK-India Year of Culture 2017 is marching on. There was a reception at the Indian high commission where Sanjoy Roy, the master of all at the Jaipur Literary Festival, welcomed us all to another gathering of artistes participating in the Year of Culture, opening the summer season. Indian high commissioner Y.K. Sinha was the affable host as always and all had a good time. We also had the launch of another UK-India initiative at the beautiful new hotel The Lalit, opened a short while ago in London by its very talented owner Jyotsna Suri. If you haven’t been there you are really missing something — the hotel has an old-world charm and grandeur created through carefully collected artefacts — many of them from India. This was the launch of a book called Winning Partnership: India-UK Relations Beyond Brexit — the brainchild of Manoj Ladwa, who is one of the best bridges between our two countries. The book has contributions by former diplomats such as Michael Arthur who was British high commissioner in India as well as Patricia Hewitt, a former Cabinet minister, who has done a lot for UK-India business relations. On the Indian side, ambassadors Ranjan Mathai and Asoke Mukerji have made their contribution. London mayor Sadiq Khan, himself a son of an immigrant of Pakistani origin, gives his view on why India-UK relations are vital. Jyotsna Suri has shared her views on the crucial role the hospitality industry can play in this relationship. Lord Meghnad Desai has also contributed to the book, and he along with the other authors met Prime Minister Narendra Modi in New Delhi and gave him a copy of the book. As India turns 70, we celebrate all those who turn 70! And so the 70th birthday celebrations of Dr Rami Ranger, arranged by his daughters, at the Grosvenor Hotel fits well into this agenda. Rami is a very well-known figure on the Indo-British circuit in the UK, and he is also a trustee with us at the Gandhi Statue Memorial Trust. Cabinet minister Sajid Javid was among those who paid rich tributes to what Rami had done for the country and the communities. The guests included Lord Bilimoria and Lord Suri as well as Baroness (Sandy) Verma. For me, Rami has a particularly poignant connection because his father was killed in 1947 in Multan while trying to save 600 students during the Partition riots. Yet Rami never gave up, and built a huge business. It is inspirational stories like his that are so important for us, while setting up the Partition Museum at Town Hall, Amritsar.